If a disturbing phrase from Milan Kundera affirms that man can never know how to deal the challenges of each day because life is a performance with no rehearsals, a painting without a sketch, a game played without training, then it is also true that there is a generally useful method for us to try to anticipate events, as fortune tellers sniff out the future in the palms of our hands. It is this: to be attentive to history. Not the History in capital letters that we learn from our school books, but the history that is happening in this second all around us and of which we are an indivisible part. We can say that for all Cubans, and in particular for the millions spread across the four corners of the earth, this is a method highly recommended for these times. Let’s look at it. If the exiles from Myanmar — democratic citizens whom a fierce military junta forced to flee from their land over decades — had been told years ago that in 2012 there would be nothing stranger than the current situation of their country, they surely would not have believed it. Burmese activists founded hundreds of organizations in exile, groups that served, especially starting in the ’90s, as the only sources of information about a country where it was impossible for observers and journalists to enter or leave. In Thailand alone, Myanmar exiles created 200 associations to denounce and fight politically, receiving substantial funding and help from the international community. They were respected, and their demands for changes in a gagged and repressed country were heard. But unexpected events rearranged the chessboard, changed the positions of the pieces. Some were even taken off the board. And those turned out to be none other than the ones who had historically played the harshest roles. The military junta that ruled the destiny of the Buddhist nation since 1962 was dissolved in 2011. Free elections were called. Hundreds of prisoners of conscience were released, including those who had been rotting in the frozen dungeons — such as the comedian U Maung Thura, sentenced in 2008 to 45 years for criticizing the government’s management during the terrible Nargis hurricane — and those who had suffered house arrest — such as the famous Aung San Suu Kyi, winner of the Nobel Peace Prize. And so with each passing day it became more difficult for the exiled Burmese to sustain their confrontational positions toward the diluted dictatorship of modern times. Or at least to do it without seeming like rebels without a cause. According to the New York Times, organizations such as the Vahu Development Institute, founded in 1980 by Burmese students exiled in Thailand, suddenly lost their sponsorships, their financial and political support, for one basic reason: the NGOs previously backing their work now believed that if the activists wanted to continue printing banners with Aung San Suu Kyi, now freed and nominated for the Burmese Parliament, and to demand free elections which had already been called, they should do it with their own resources. Some have returned to the changing Myanmar. The vast majority have not. Rooted in their lives in exile, they have built their families, their businesses, their political doctrines, on a base that has suddenly started to crumble: the enemy has not totally evaporated, but almost. Myanmar has changed before their eyes, and they are no longer in the game. With their poorly healed loves, wearing their hearts on their sleeves, they don’t see they have ceased to be anachronistic fighters facing the reality they sought, dreamed of, fought for. The tragedy now is that they can’t stop seeing it, and they cannot adapt themselves to the new circumstances. 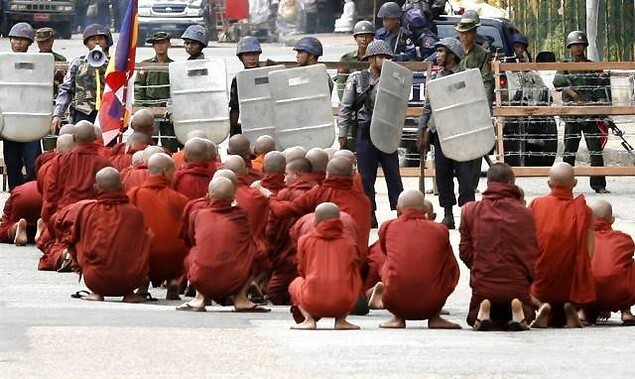 I don’t believe there is a more suggestive and instructive example for us, Cubans of the diaspora, than this logical course taken by a country where, since 2007, the monks — is there an image more peaceful than that of a Buddhist monk? — were met with bullets in their marches in opposition. To compare the lethargic moves of the military junta leading Cuba with the process implemented in Myanmar would be hasty and inexact. But to ignore the fact that a journey of a thousand miles always begins with a single step, is to make the mistake that this example of the Buddhist nation alerts us to: to close our eyes and remain in our entrenched positions. To fail to pay attention. 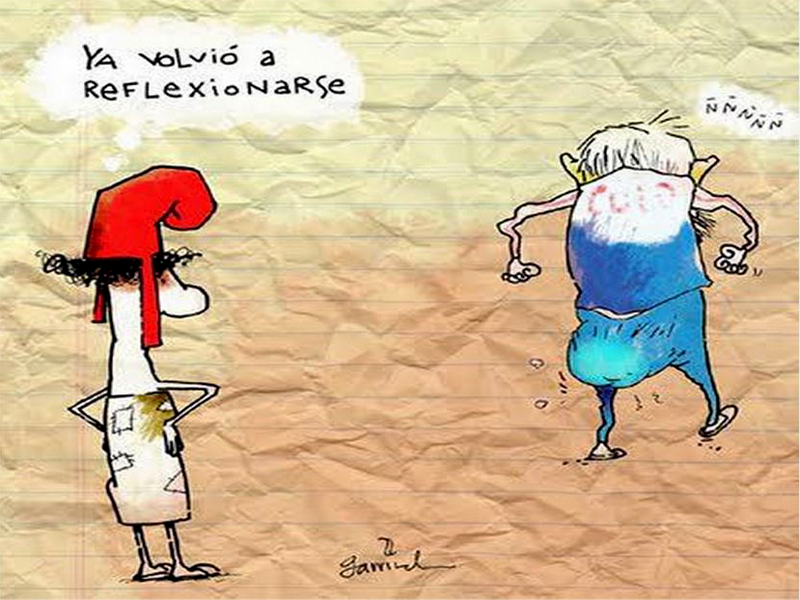 The government of Raul Castro has generated no political change of real weight. But to refuse to admit that in the last four years Cuban society has experienced more alterations than in the last two decades of Fidel’s mandate, would be naive, as well as damaging to winning strategies. The more superficial and insufficient, the more elementary we assume these changes to be, and above all — after a wait of five plus decades — to deny their existence, does no harm to the government in Havana, nor does it do any favors to the democratic exiles. Rather, it is the first step along this treacherous road of disconnect that many Burmese exiles are now experiencing. Success against an entrenched enemy, one that has been barely damaged by the techniques of the siege, lies in taking advantage of its timid, trembling, cautious, cowardly, and at times imperceptible maneuvers of surrender. I could not say that the release of the 75 prisoners of the Black Spring, the respect for religious freedom (which even Secretary of State Hillary Clinton acknowledged in 2010), the sale and purchase of houses and cars, or the implementation of lines of credit to support the businesses of entrepreneurs, are the trumpets that announce the cataclysm. But taken all together, looked at under an objective prism, they can only point toward changes in survival that, if the millions of Cuban exiles know how to take advantage of them, could imply much more than that. The half century of antagonistic positions do not leave us at the margin of a Cuban reality that is inevitably dialectical, and that at this very minute could be living its death rattle in an atmosphere of misleading passivity. As it has always been. So be it. Minutes before their collapse, all the buildings stood proudly. Those who have committed their lives in body and soul to reclaiming a nation, “For all and for the good of all,” from an exile never desired, have a challenge of precise intelligence this time, of precious calculation: to not allow the democratization of Cuba to begin with them out of the game. Myanmar leaves her lesson in our hands. If a some genuine idolatry remains for the old, the idolater must be suffering a severe existential crisis. The lackeys with pedigree, the real ones, suffer the unspeakable when their idols are revealed as mere humans, and, in cases like this — Fidel Castro publicly exposed for 6 hours — a human grotesque. To associate the iconographic Fidel Castro, the one that obliged Virgilio Piñera to clench his sphincter so as not to urinate in fear of at behemoth with a gun in his belt he met in 1961 with other intellectuals gone astray; to associate with this old man of bony cheekbones, emancipated jaw and eyes moving against the grain of the story, could be understood in the field of biology, but idolaters assume biology as a matter of mortals. And how to get an idea that the Supreme Leader also will become sometime a graceful old man like this, an old man who only serves to be made fun of? The ominous symbolism this man carries does not impede us from enjoying the hilarious comedy that featured in his most recent speech at the launch of his memoirs in the Palace of Conventions in Havana. Guerrilla of Time, is the title of this book from Katiuska Blanco, the diligent scribe destined to type these nearly thousand pages of fiction separated into two volumes. Guerrilla of Time. The satraps and their unique manias: some raised pyramids, others constructed memoirs with pharaonic titles. Maybe the two volumes of this quasi-posthumous delirium of Fidel Castro will no longer serve to decorate the official salons and as gifts for the party vanguard, but the colorful launch of this caprice of power, what was said and not said in this little room of the Palace of Conventions, is not wasted. As they are quick to say: there History was made. The old man spoke of the human and divine. His audience, composed of an exotic mortar of frauds, idolaters, and useful idiots, laughed heartily when the commander asked them to, and stifled their genuine laughter when prudence suggested it. Among lightheadedness and hiccups, including delusions and voice problems, now whispering, now pronouncing indecipherable gibberish like one who speaks an extinct language, Castro more of an exhibition than ever, mentioned, for example, a hybrid between his deceased sister-in-law and the president of Brazil (“Vilma” Rousseff); confessed the error of setting an entire people to study Russian when the whole world was learning English; and when they gave him the phone to talk to the released spy Rene Gonzalez, he mistook him for another member of the Wasp network behind bars, Antonio Guerrero. He was commanded to run. In all probability this could be the last major public appearance of yesterday’s strongman of the island, today a framework of bones, badly combed hair and babbling colors. I do not think his body can take another six hours of cantata, although with this archaeological specimen one never knows, really. But like a bittersweet ending, as this turn of tragicomedy that cuts the smile until it becomes a painful grimace, the presentation of the first two volumes of the memoirs of Fidel Castro will leave an image as an historical shame: intellectuals, artists, scientists, teachers, converted into puppets on their strings who applaud, laugh or get excited at the moment a brain scorched by the time requests it, and even, if necessary, an auditorium that would become the army of nurses willing to change the soiled diaper of the incontinent leader. If, at the moment she stepped foot on U.S. soil that June 9, 2011, someone had whispered in Reina Luisa Tamayo’s ear that barely seven months later, this January 31, 2011, she would be at the Versailles Restaurant not as a heroic mother, but as a woman in need of support and understanding; no longer a protagonist of a campaign to defend universal human rights for which her son died, but rather in a campaign for her own economic aid, she wold have thought it was one more of Castro’s manipulations. Too many lies had been targeted at this humble woman who, in the midst of her pain, had to see herself on Cuban television, spied on by a hidden camera in the office of her son’s doctor, maligned, even about her integrity as a mother. Seven months ago Reina Luise appeared before other cameras, at the Miami International Airport, with the ashes of her poor son in her arms, surrounded by a delegation of activists and leaders of the exile — including a federal congresswoman — receiving the treatment of a heroine: admiration, promises of aid, family invitations, a site for the eternal rest of her son. The media fought over her. Everyone wanted to talk to her, congratulate her, honor her. Reina Louisa was news. Behind the scenes, the only ones ignorant of what would soon happen in their lives, were the twelve family members who sought political asylum at her side, and Reina Luisa herself. Recent statements by the Lady in White, offered to the journalist Pedro Sevcec on his program “Sevcec a Fondo” of América TeVé, where she stated explicitly that on her arrival in the United States she was manipulated, and that she and her twelve family members felt cheated, and where she tried to keep her voice from cracking when she responded the question of the host about whether she regretted coming to this country, were the sad time bomb that we all knew would eventually have to explode. Lately, Reina Luisa prefers not to give interviews. It’s easy to see why. 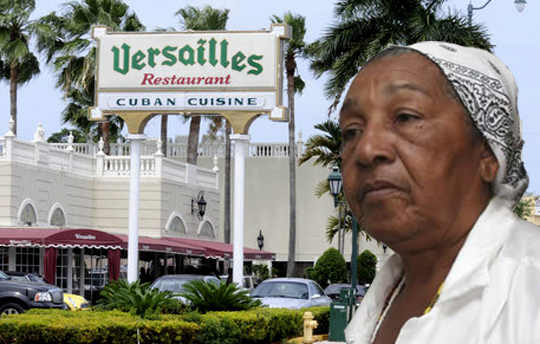 But now she has broken her silence and returned to the news, this time to look at the promises that lured her to American soil which turned out to be unreal, to present how she and her family have been simply used by a political and ideological machinery opposed to what harassed her in Cuba, the real story has surfaced. And in a very painful way. First the family was lacerated by the Cuban government’s repression. Then, the sordid reality of a distant exile, where many end up dying of a badly healed nostalgia, and where those who don’t know how to care for themselves only have one option in the range of possibilities: to never come. Would it be wroth it to investigate the history of the broken promises made to this family by the exile organizations and leaders? Of course. 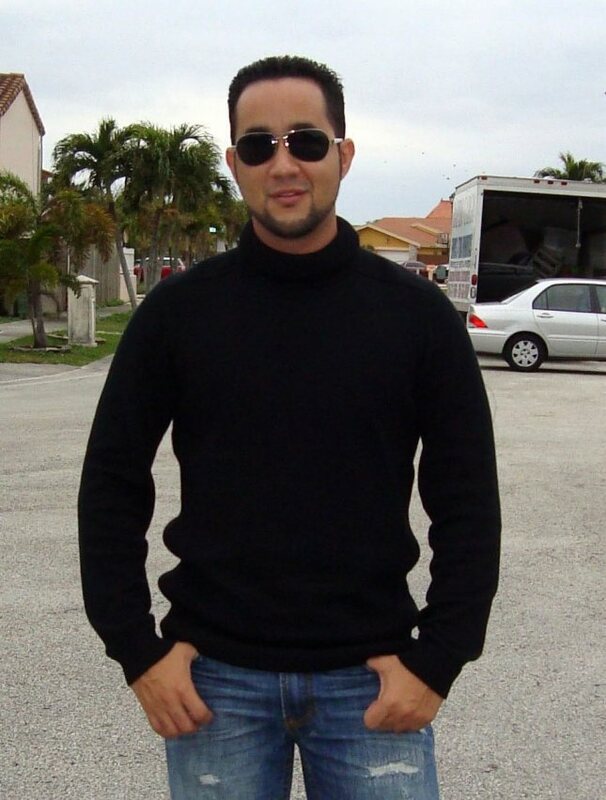 Not to corroborate what we already know, but to demonstrate how much these humble Cubans were lied to in order to bring more victims to Miami, at any cost. It would be worthwhile to ask who told thirteen people, with poor educations, and a woman of 65 with health problems, that they would be supported indefinitely in a city where everyone has to strive not to increase the existing 11.5% unemployment figure, and where thousands of those born here, bi-lingual, and with full knowledge of the society, cannot get jobs to support themselves, or must work as cleaners — as Reina Luise states she has had to do — in order to pay their bills. When Reian Luisa, implored from Banes, Holguin, to change the family’s original destination from Arizona to warm and “known” Miami, she thought she knew what she was doing. That is: to arrive at the place where her comrades in the cause and pain could better help her and hers. The efforts of the Chair of the Foreign Affairs Committee of the House of Representatives, Congresswoman Ileana Ros-Lehtinen, turned her request into an immediate order. Today, Orlando Zapata Tamayo’s mother is learning her lesson in the most difficult was possible: in free societies, not only do we enjoy inalienable rights, we also contract enormous obligations. The first and foremost: the obligation to take care of our own lives. So we live in the best part of the civilized world. So we live in the society of the United States where, hopefully I’m wrong, Reina Luisa will probably never adapt. To all this, the crossfire. From Cuba the propaganda apparatus laughs and shows a captive people the benefits of an exile, where icons, like Reina Luisa, say they feel betrayed seven months after arriving in freedom. In Miami, too many voices begin to use words like “ungrateful” and “unfair” to name the thirteen relatives of the martyr. How do you explain to a woman who did not choose her own destiny, who has been a victim of it; a woman lacking education, without her Santiago birthplace and her adopted Banes, without an existence beyond the excruciating pain of losing a child; how to you explain to her that now she and hers must fend for themselves, away from the television cameras, away from the headlines, without organizations or politicians now too absorbed in election year politics? How do you make her understand that the concept of the paternalistic State, where houses “are given,” where you don’t have to pay for health care, where if you lack sugar or rice the solution is to ask to borrow from the misery of your neighbor, that all that is in the past, that in this land not only is freedom won, but, above all, responsibility for one’s own destiny. How do you make her understand that she would be invited to speak to the Congress of the United States, that she would be invited to tell her story in Boston and Puerto Rico, but that once the narration was finished she would have to pay her own bills for electricity, cable, telephone and transportation? No, it’s not possible. As it is not possible to return her son to her, and to return her happy and humble life in Banes from years earlier to her. Like it will not be possible to go from door to door of all those in Miami who promised her guaranteed support, and demand that they fulfill their promises. The image of Reina Luisa Tamayo this January 31 in the Versailles restaurant, appealing to her symbolism to move the sentiments of anyone who could offer a job in consolation for her and some of her family members, seems to me a huge sadness. And I suspect that those directly responsible for this reality don’t even know what has happened today to the mother of Orlando Zapata, nor do they care. 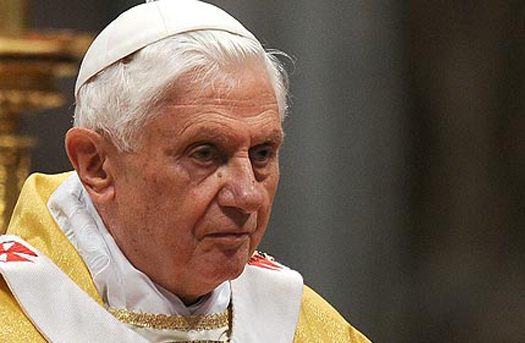 To the already boiling cauldron that awaits Benedict XVI on the tropical island he will visit this coming March, another definitive ingredient has just been added: A too possible death. Unfortunately probable. If it was complex to step on Mexican soil where, according to official figures, 47,515 people have lost their lives since Felipe Calderon declared the war on drug trafficking in 2006, at least the Pope had a countervailing reality: It’s a democracy. And in democracies, one can pray for the victims, call for peace, criticize the incumbent president. Without major complications. It’s another kettle of fish when the papal visit makes landfall in the world of dictators. There, the world is turned on its ear, eyes are ready, as if at a fair, sniffing, questioning and observing how the saint conducts himself. And His Holiness knows that whatever he says or does not say will be urgently used by the dictators, or their detractors. In the troubled reality of a country where hundreds of political prisoners cry out for justice from their cells; where women are beaten by unscrupulous police in uniform or in plain clothes; where too many controversial deaths have occurred in a couple of years (Zapata, Juan Wilfredo , Laura); is now added what could be a black harbinger of his visit, too shocking to be ignored by the Vatican: Wilmar Villar Santiago Mendoza, ready to die at any second. The political opponent, sentenced to four years in jail for contempt, resistance and attack (yes, those euphemisms by which the Cuban Penal Code defines the act of public protest), is reported to be in very serious condition after more than 50 days on hunger strike, and according to testimony from relatives, “only a miracle could save him” from the terrible complications of pneumonia. Miracles do happen, we know. But too sporadically. And if you’re not in the hands of the Pope — relying on his exalted credentials — to ask for a miracle for this poor Cuban on the verge of death, makes the labyrinth of Pope Benedict XVI, I believe, even more intractable. Why? First, because if he finally meets the archaeological Fidel Castro, a symbolic leader with no official power today, there would be no justification not to meet with the Ladies in White or some of the dissidents who have asked for attention from the Papal Nuncio. I do not think that in just three days of hectic travel the 84-year-old man has time for both. Second, because if it was already scandalous for a representative of universal peace and harmony to visit a country with one of the largest prison populations in the world, where political opponents have died in hunger strikes or in circumstances never clarified, and not to ask publicly and forcefully about them, it would be unforgivable to arrive in a country where only weeks before another dissident has died from a horrible hunger strike, and to remain silent. The critical condition of Wilmar Villar Mendoza has given a brutal slap to the table where both sides receive his letters: on one hand the Catholic Church, with its absolute guide stepping on Cuban soil, and on the other the Cuban government represented by the evil alter-ego of Fidel Castro that is his younger brother. Because the Vatican could announce without shame that its relations with the Cuban government have improved markedly in recent years, when even Secretary of State Hillary Clinton acknowledged in her 2010 annual report on religious freedom in the world that Cuba had shown remarkable progress in this regard, and when 75 political prisoners were released thanks to the efforts of the church. But (unless the miracle asked for by Wilmar Villar Mendoza’s doctors takes place, I repeat) I do not think the Pope wants to carry the same eternal stigma that Luiz Inacio Lula da Silva will carry, having visited the island when Orlando Zapata had just been buried, and having kept an embarrassing silence in this regard. The families of the brave Santiaguan will be the only ones to weep with real pain if the end that they themselves, devastated, have predicted comes to pass. But for elementary practical opportunism, I don’t know who desires more that this young man — crushed by a hunger strike — recovers his health at the last minute: the satraps of my country, or Benedict XVI. In the distance, a horizon of clouds promised to relieve the temperature. From my bicycle I felt the comfort ahead of time, even though my sweat was forcing me to squint to see the semi-deserted road. On my back a backpack, inside it a bouquet of flowers. The pedaling became much easier. Before arriving at the cemetery, a short slope slipped the tires almost to the corroded and faded double iron doors that lead into the sacred ground. Sacred ground: crass euphemism. The depression of the cemetery of my city killed the dead. I had only a name beginning with “A,” the year of death and the approximate month of the funeral. “Mama doesn’t remember well, Ernesto, forgive me for burdening you even more with this task.” So my search relied on two and a half pieces of data and a mountain of good will. I was lucky: I happened on the most solicitous employee of that sad place. Cemeteries usually infect the living with their effluvia. The employee, with a translucent shirt he had to constantly pull away from his torso, bathed in sweat, and with thick glasses, put a book in front of me that seemed to hold all the truths of this world, and of another, never better said. And there I passed my next two hours. In a volume of almost five thousand pages, written in pencil, deciphering the hieroglyphics of hurried and disinterested letters, trying to find the exact date of the burial of a lady I had never known but who was very important to someone else, a stranger. Once we knew the date she entered the necropolis, we would know the street, row and pantheon where her remains reposed. The pictures took longer than expected. Standing before the rectangle of cement that covered — like a headstone — the grave of Amanda who never made it twenty, I found myself not knowing what to do. How to send images of such a scary place, with stinking weeds surrounding the edges of the sepulcher, a bent and rusty tin cross adorning the head, a powdery dust announcing the state of abandonment of Amanda’s grave. I cleaned it. I straightened the cross as best I could. Without any tools, aided only by my hands and will, I cleared the site of weeds run wild. I pulled the flowers from my backpack, put them in a reliquary filled with water. My sweat pasted my T-shirt to my body. Overhead the clouds darkened the sky announcing their danger: a downpour and me on a bicycle. The image of a distant family, an elderly woman eyes moist, honoring with her tears the site of her beautiful sister; the image of a stranger hugging his mother, thinking about his aunt and putting into context the abstraction of his mythical Amanda; the beautiful charge of my enterprise absorbed every second of the afternoon. When I was sure that some thirty digital photos would allow me to choose which ones to send off electronically, which would offer the best panorama, the most comprehensive, the least depressing possible, I thanked the employee with a handshake that represented myself and those exiled from Bayamo, and began to pedal once again. No, the infamous downpour didn’t damage the digital camera. I did damage the gears of the bike which, without grease, made a noise like grasshoppers for several weeks. But the photos were safe. If I could manage to connect myself to the Internet (with my clandestine connection), in a few minutes a stranger’s afternoon would change completely. On February 20, 2011, two months and twenty days after stepping on American soil, an article entitled “Uncomfortable Freedoms” appeared on this blog. It was my position on the American restrictions on travel and remittances to Cuba — which months later I addressed in other texts — where I responsibly criticized the positions of Senators Bob Menendez and Marco Rubio. I smiled halfheartedly. I had just win something like an enemy, who would not hesitate in the future to employ offensive epithets against me from his patriotic and well-known blog, and between us was raised an impenetrable wall of political posturing. I never got to know him. The lunch date set for some weekend never came to pass. I was sorry I wouldn’t get to kiss an old woman who kept intact her love for her dead sister, that I could not tell her in my own voice the details of the day when I humbly honored the memory of her Amanda. I carefully conserve the memory of a sweaty Ernesto, determined to clean an unknown grave, excited at the thought of causing happiness in a distant home. And since then I have also conserved an almost absolute certainty: I am not disposed to believe in libertarian yearnings, in the search for the well-being of a trampled Country, from someone who is not capable of refining his own human condition. And I nodded because I knew too well what she was talking about. For her, a woman from Santiago who hadn’t stepped foot on her native land since 1999, living in Miami and linked to the Hispanic media, it was a startling discovery. For me, with my memory too fresh, it was just a description of a cadaver that I knew every inch of: the cadaver of Cuban freedom, seen through the lens of national apathy. My interlocutor had returned the day before from her simmering and fun-loving Santiago. She went there more for a family emergency than for an excess of nostalgia or tourist reasons: her mother has lung cancer. Her narratives of a country defeated by an army of the hungry, the ineptitude, the lack of productivity, the shortages and unsanitary conditions, fell into the background. She summarized it in two quick sentences. What did she find? A panorama that she seemed to be seeing again in front of me, image after image: a sweaty crowd, their carefree faces, moving their hips to the beat of reggaeton playing on the speakers. Hundreds of young people pressed tightly together, not to defend women from police beatings, but to buy the bad-smelling beer sold by the State. Arguments, at full throttle, hundreds of screams, not asking to be able to travel freely, not demanding freedom of expression and association, but rather discussing the latest baseball game between the Industriales and Santiago. Inevitably, I recall the opposition I knew in my country: honest, consistent, serious. People who had paid a huge price for daring not to be two-faced. But I couldn’t help but think, also, of a certain little up-and-comer in a youth opposition party in my city who, after my expulsion from the mass media, wanted to “hire” me to teach journalism to the ten members of his group. What was the attraction that “freedom fighter” found to tempt me with his offer? I still check my conscience regarding whether I was too hurtful in my response. But what I don’t doubt is the God’s truth: The romantic enthusiasm that permeates certain circles outside Cuba, that constant feeling of the epic of a people in struggle against their oppressors, this perspective of society that has closed ranks in search of its rights; it is a beautiful view, but false. Cuba has eleven million souls. Ivonne Malleza is one. José Daniel Ferrer is one. The Cuban Commission for Human Rights and National Reconciliation is Elizardo Sanchez. Bloggers truly active in the struggle don’t exceed ten. Yoani is one. Dagoberto is one. Biscet is one. The courageous protagonists who protest by banging on pots and pans in the Cuatro Caminos markets and who protests in Fraternity Park never exceed five, always surrounded by fifty, a hundred, impassive observers who do not move a finger to fend off the thugs. I want them to be more. There were not ninety Ladies in White scattered throughout the country, but there were at least ninety thousand that should have been. I wish that the nine million Cubans who affixed their signatures (signatures infected with fear and apathy) in 2002 to guarantee Socialism in the Constitution of the Republic, would have added more of their names to the Varela Project, which that same year collected eleven thousand real names. I wish that one day the crowd would be reversed, and that the handful of those cornered, encircled by the crowd, were not Laura Pollan and her women, but rather the tools of the system surrounded by brave Cubans. But my desire is not enough. 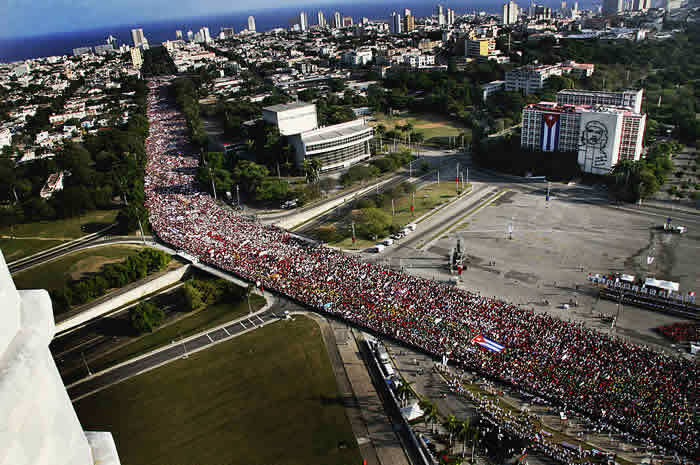 We Cubans crush the larvae under military boots, and as Kant warned, “Whomever voluntarily turns worm should not protest if they decide to trample him.” Two million of us have escaped. Eleven million remain inside. Half of those eleven million also want to escape. Of the other half, the majority watch the bulls from the sidelines and wait for better times. They subsist. A much too small minority don’t want to escape, nor are they resigned to living without freedom, They are almost as few as the family that has taken over the whole Island, and that will drift away only when all its members are already dead. So brief is the recent history of my country. In a cruel paragraph one can put tons of words, books, frustrations, desires, longings. I think it’s time to take off our masks and look at our wrinkles in the mirror: The Castros won. They will die in power. They will yield when it pleases them, or when it pleases biology. And the millions of Cubans (unmotivated at present) in the public plazas every May Day, the hundreds of Central Havanans congregating in front of the homes of the disaffected to launch repudiations, insults, blows, and those who looked with amazement at my friend, a woman from Santiago who thought she would find her countrymen at war and found them at a party, they are the undeniable trophy of the winners.